Most pet owners base their choice of pet food on a brand’s reputation for safety and quality. But judging a food’s quality and safety can be challenging. 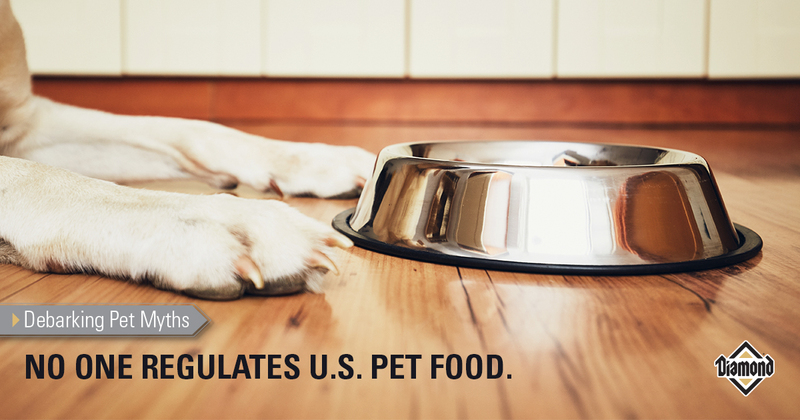 And if you’ve spent any time online, you’ve probably read about this month’s popular and often-repeated misconception about pet food: No one regulates pet food in the United States. It’s a myth that’s completely false. The fact is, in the United States, pet food is one of the most highly regulated food products, and it’s regulated at both the federal and state levels. Several agencies regulate pet food manufacturing and labeling: the U.S. Food and Drug Administration (FDA), U.S. Department of Agriculture (USDA), Federal Trade Commission (FTC) and individual state departments of agriculture. The FDA is also responsible for reviewing and approving food additives before they can be marketed, regardless of whether they’ll be used in human or pet foods. A food additive is any substance that directly or indirectly becomes part of a food or that affects a food’s characteristics, such as dyes and carrageenan. More recently, the Food Safety Modernization Act (FSMA) mandated comprehensive changes to U.S. food safety regulations. This law created new requirements and mandatory product safety standards for almost all human and pet food makers, and focuses on preventing food-related illness rather than reacting and correcting issues. Some of the law’s requirements have already been put into place; others must be in place by fall 2017 (if they aren’t already). At the state level, dog and cat foods may be even more tightly regulated, depending on the state and its feed control laws, food and drug acts, and weights and measures acts. Most states require pet food makers to register each product before it may be sold within that state. The registration process often involves state-level evaluations of products and labels to ensure compliance with state requirements. AAFCO members have created model pet food regulations, which many states have adopted. Working with nutrition experts, the organization also established nutrient profiles for dog and cat foods based on the nutrient requirements identified by the National Research Council. We all — pet owners, veterinary nutritionists, veterinarians, pet food manufacturers and regulatory officials — want the same thing: safe, high-quality pet food. And it’s something that pet food makers, including Diamond Pet Foods, take very seriously.